CD includes the meditation, In Loving Memory. 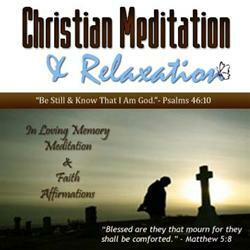 Each meditation begins with a progressive relaxation, followed by a Biblical narrative and relaxing background music. Has a Loved One Passed Away Recently? Are You Still Carrying Pain, Fear, or Guilt of Someone Who Died Long Ago? Is a Friend or Loved One Grieving a Loss? In Loving Memory was created for anyone who has lost someone special and is gripped with a variety of emotions from fear, guilt, pain, to despair. God gives us specific promises regarding heart-break, grief, mourning, and sorrow. I wanted this meditation to remind us of God faithfulness and love in such times of grief.